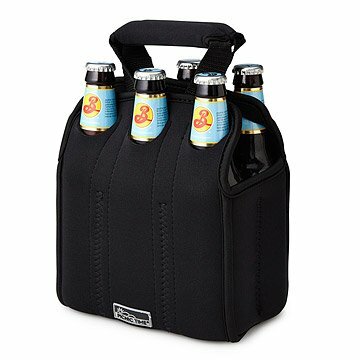 This neoprene tote cools and carries any six pack of bottles or cans. Like an insulating wetsuit for frosty bottles and cans, this neoprene tote is the perfect companion for a cold six-pack of your favorite beverage. Six interior compartments hold any bottle or can (up to 20 oz. ), while a seventh in the center accommodates an ice pack to keep everything icy while you're on the go. Six holes in the top flaps fold over bottle tops to keep them secure, and an exterior side pocket holds a bottle opener or other small accessories. Just add thirsty friends and a laid-back, sunny day. Made in China. Hand wash. Use mild detergent to spot clean. Let air dry. My bf takes it with him every time we bike to the beach. It's so portable and easy to carry. It keeps our drinks cool while we chill and eat snacks at the beach! It is so easy to just pack it and go. Bought this for my dad for Christmas and he loved it! Very stretchy and feels pretty durable too, the bottles fit in perfectly. The cooler is a great idea, but the size is too small. Advertised showing it with cans. They do not fit. Slim bottles are a tight squeeze. Ordered 2 as gifts - they were a hit! I filled the 2 that I gave away with 6 packs of bottles of their favorite beverages, and slipped a fun bottle opener into the front pocket of each as well. It was a bit of a challenge to pull the carrier over the last 2 bottles, but this thing stretches like a wetsuit. We hangout with friends all the time and used to just throw beers into a bag. This is great because it keeps everything cold and it's easy to carry. Just wish it was a little bigger so we could squeeze more alcohol into it! This product makes a great gift! My Father in law will love using it at the lake. Love how secure it holds the bottles. No more bulky coolers! Perfect cooler for water, beer, or Gatorade at sporting events. Compacted & convenient. Love it! I hope this will accommodate a normal 6-pack. I should have tried that prior to wrapping, as it certainly wouldn't fit the larger bottles I was hoping. I thought it would have more give, but since it does not, perhaps it will last longer!